At 6 am, we're lucky if we have the energy to reach for a cup of coffee. Mornings may be rough for some of us, but hold off on sleeping in: There are perks to waking up with the sun. (And we have some tips to make it easier, too!). The old "I'm just too tired" complaint may be more than a sorry excuse for waking up late. Research suggests there are biological differences between early larks, who wake up at the same time every morning and feel most active around 9 am, and night owls, who get more sh!t done once the sun goes down. One survey found more than half of Americans fall into the morning category, saying they're at their "personal best" from 5 am to 12 pm. And it may get easier to greet the day at dawn as we get older, thanks to body clock changes as we age. It turns out the early bird may get more than the worm. According to self-reports from college students, those who wake up earlier feel more optimistic and proactive than those who rise later. Other studies have found morning larks tend to be harder working and conscientious than night owls. (Still, it's not clear whether waking up early actually makes someone more productive or optimistic.) And perhaps the secret to a 4.0 isn't only hitting the books: Another study of university undergraduates found those who said they function better in the morning received higher grades than those who preferred the evening. That's possibly because morning risers are more likely to get to class on time or to forgo late-night partying. Researchers also suggest memory may improve during sleep, so getting to bed earlier in preparation for a morning alarm could help those exam notes soak in. Get enough sleep. It may seem obvious, but getting those recommended seven to nine hours will make getting up earlier easier. Pro tip? Keep the laptop and other work out of the bed to sleep soundly. Stay consistent. Try to set the alarm clock for the same time every morning—including weekends. A constant wakeup call may make it progressively easier to jump out of bed. Start slowly. Pick a new wakeup time and gradually work towards it. Want to wake up at 7 am but stuck at 8 am? Start by setting the clock for 7:45, and move down in 15-minute increments until that new time goal is reached. Skip the snooze. 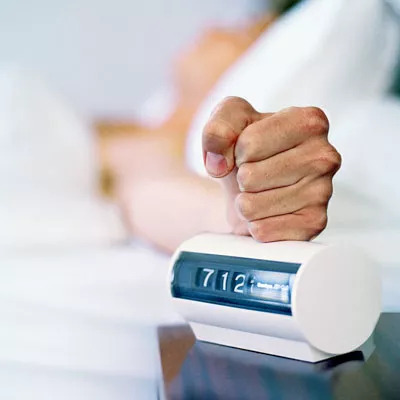 Disrupting sleep an hour or so before actually getting out of bed may disturb our REM cycle, which helps stimulate brain regions linked to cognition. Don't want to mess with that (or bug a roommate with multiple alarms!). Set one alarm for when it's time to rise—and maybe another a few minutes later in case you snooze through! Set some happy sounds. Skip the beeps and blares and set an alarm tone to something soothing or fun. Need an idea? Here are 10. Eat breakfast. Sleepiness doesn't disappear just from drinking a cup of coffee. Having enough time for some green eggs and ham (or maybe just a yogurt parfait) will also provide energy, not to mention it'll boost that brainpower, too. Hit the gym. Those tired eyes may go away once a morning workout routine is in order. Exercise will definitely boost energy—give these early-bird exercises a try! Treat yo'self. Have a reward waiting in the a.m. to motivate climbing out of the covers. Dive into some freshly baked fruit and nut bars, or slide into a warm bath instead of taking a quick shower. J.F.D.I. Sometimes we need to bite the bullet and "just f'ing do it." Researchers have found that creativity may flourish when we feel groggy, so don't let a little drowsiness interrupt seizing the day!